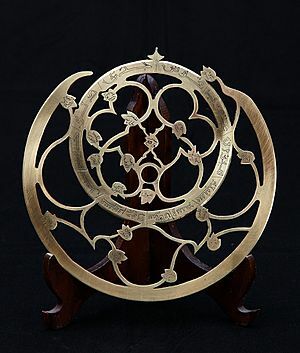 Astrolabe of brass alloy (Copper and zinc). An alloy is a uniform mixture. It is made up of two or more chemical elements, of which at least one is a metal. An alloy has properties different from the metals it is made of. Most alloys are made by melting the metals, mixing them while they are liquid to form a solution, then leaving them to cool and turn solid again. Combining a pure metal with one or more other metals or non-metals often makes it better. For example, steel is an alloy made from iron but it is stronger than iron. Physical properties like density, reactivity and electrical and thermal (heat) conductivity may not be much different than the elements (substances) which make the alloy. But, properties like strength can be very much different. The first alloy to be discovered was Bronze. Bronze is made from copper and tin. Bronze was discovered a very long time ago in the prehistoric period. Then, bronze was being used for making tools and weapons. This period was known as Bronze Age. But, later better alloys were discovered which replaced bronze for making tools and weapons. Now, bronze is used for making ornaments, statues, and bells. Brass is another alloy made from copper and zinc. Melting point is the temperature at which a solid changes to liquid. Most alloys do not have a single melting point. 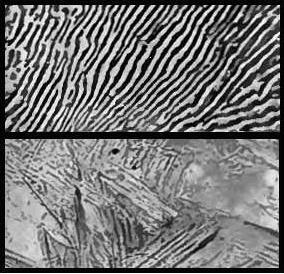 They have a melting range in which the alloy is a mixture of solid and liquid stages. The temperature at which melting just starts is called solidus and the temperature at which the melting is just finished is called liquidus. The term alloy means a mixture of atoms in which the main substance or the primary constituent is a metal. This primary metal is called the base or matrix. If an alloy has only two types of atoms, like copper-nickel alloy, then such an alloy is called binary alloy. If an alloy has three types of atoms, like iron, nickel and chromium, then it is called a ternary alloy. An alloy with four types of atoms is called a quaternary alloy and an alloy with five types of atoms is called a quinary alloy. Different varieties or forms of alloys can be made from the same constituent materials (substances from which the alloy is formed). These different forms or varieties can be formed by using different amounts of the constituents. The whole range of possible varieties of an alloy is called a system. All the forms of alloy having only two constituents are called a binary system. All forms of an alloy having three constituents are called a ternary system. Brass is made of 35% zinc and 65% copper and is used for musical instruments, jewellery, faucets and decorative hardware. Stainless steel is made of 18% chromium, 80.6% iron, 1% nickel and 0.4% carbon and is used for tableware, cookware and surgical tools. Steel is made of 99% iron and 1% carbon and is used for tools, car bodies, machinery, girders and rails. Bronze is made of mostly copper and some tin and is used for boat hardware, screws and grill work. Alnico is a mix of aluminium, nickel and cobalt, and it is used to make permanent magnets. Wire rope made from steel, which is a metal alloy whose major component is iron, with carbon content between 0.02% and 2.14% by mass. Alloy Facts for Kids. Kiddle Encyclopedia.